As promised, I’m back with the cards that my Lismore girls made yesterday for their monthly Stamp-a-stack. This card featured a new technique that I was just trying out for the first time. 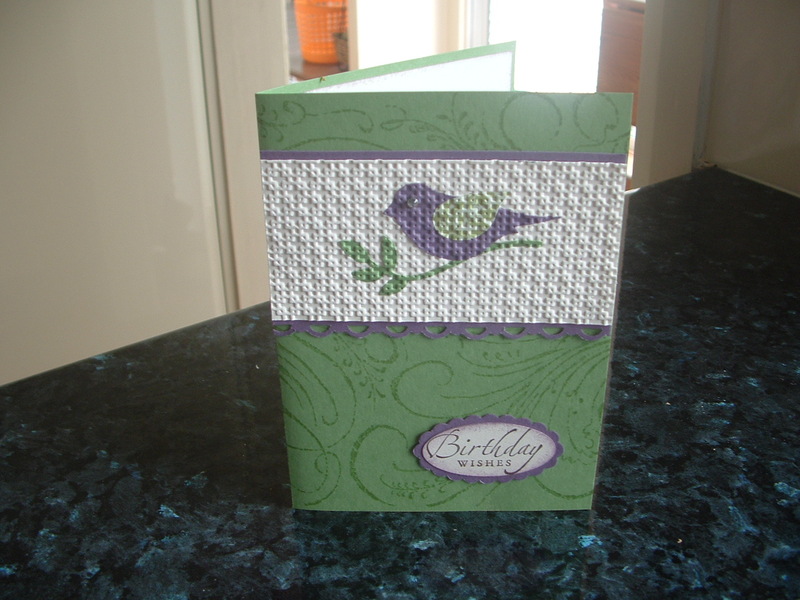 It’s called ‘Inlaid Embossing’ and thanks to my Stampin’up! downline in Inverell, Marion Benfield, I’ve mastered it at last. Hope you like it! If you think you may be interested in a stamp-a-stack, they are great value. Ten cards (5 of 2 designs) for $20. Bargain! this includes envelopes and inserts. Everything is cut for you, all you do is stamp or punch out the images and assemble. Of course there’s lots of giggling and chatting to be done. It’s a great time. Give me a call if you’d like to book one for yourself and a few of your friends. Great time to start during Sale-a-bration ’cause for every $100 you spend you get a free stamp set. All products were Stampin’ Up! – of course!